Stretching 2,700 miles (4,300km) along the Pacific Coast of South America, the distinctive ribbon of land that is Chile is only 109 miles (175km) wide on average. This unique shape gives Chile a widely varied climate and terrain, and contributes much to the incredible natural diversity that makes the country so attractive to tourists. Ranging from the hot and dry Atacama Desert in the north all the way to the cold and windy Tierra del Fuego on the doorstep of Antarctica at the southern tip of the continent, Chile's landscapes includes dense jungles, towering mountain peaks, mammoth glaciers, rolling winelands, picturesque fjords and pristine beaches. All this natural glory makes Chile one of the most celebrated travel destinations in the world among outdoor enthusiasts, and to complete its touristic offering the country also boasts cosmopolitan cities, fascinating traditional cultural enclaves, and a well-oiled infrastructure which sets it apart from much of South America for ease of travel. Vibrant cities like Santiago and Valparaíso offer stately mansions and historical monuments, world-famous street art, buzzing nightlife and interesting museums. More remote areas, like Isla Grande de Chiloe and San Pedro de Atacama promise a taste of older, more traditional Chilean culture. The most intrepid explorers can earn their stripes by venturing far out to sea to Easter Island, to see the famous and enigmatic statues that have puzzled archaeologists for centuries, or head into the vast nature reserves of Chilean Patagonia to experience one of the most remote and pristine wildernesses left on earth. A holiday in Chile promises excitement and enjoyment for all types of travellers, and an unforgettable South American adventure. Chile's climate varies dramatically from north to south, with stark changes in temperature from summer to winter. While the summer months in Chile (December to February) are the warmest, the season can be very windy, especially in the southern part of the country. The best time to visit much of Chile is in the shoulder seasons, including October and November, and March and April, but this is not true of Patagonia which is definitely best experienced in the summer months. The cold winters are the worst time to visit, unless you are planning a skiing holiday. Read more on Chile's Climate and Weather. -See the giant and mysterious statues of Easter Island. -Visit the Magdalena Island Penguin Reserve in Chilean Patagonia. -Spot rare indigenous animals in Parque Nacional Chiloe. -Watch the El Tatio Geysers shoot clouds of steam into the air in the northern desert. -Stroll through the busy markets and stately buildings of Santiago. -Take a cruise along the fjords of Chile's Lake District. -Sample local vintages on a tour of Chilean wine country. -Relax in the resort town of Pucon on Lake Villarica. Getting to Chile from the US is simple, as there are direct flights to Santiago from many US cities. There are only occasional direct flights to Chile from the UK, but there are indirect flights available from a few major airports. Get more information on Chile Airports. Daughter of Fortune by Isabel Allende and Tierra del Fuego by Francisco Coloane. Post Mortem (2010), The Motorcycle Diaries (2004). Carmenere (Chilean red wine) and Pisco. Freshly-caught Chilean sea bass and seafood stew. Lapis Lazuli jewellery, alpaca shawls and leather goods. Warm layers, including a waterproof jacket for sudden showers. 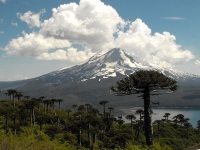 -Along the mountainous region of Chile there are more than 1,300 volcanoes, a number of them still active. -Chile is one of only two countries in South America that doesn't border Brazil. -Catholicism is the primary religion in Chile. Chile's wildly diverse landscape contains many adventures for intrepid travellers and its stability and economic prosperity make it a great introduction to South America for those less inclined to rough it on the tourist trail.